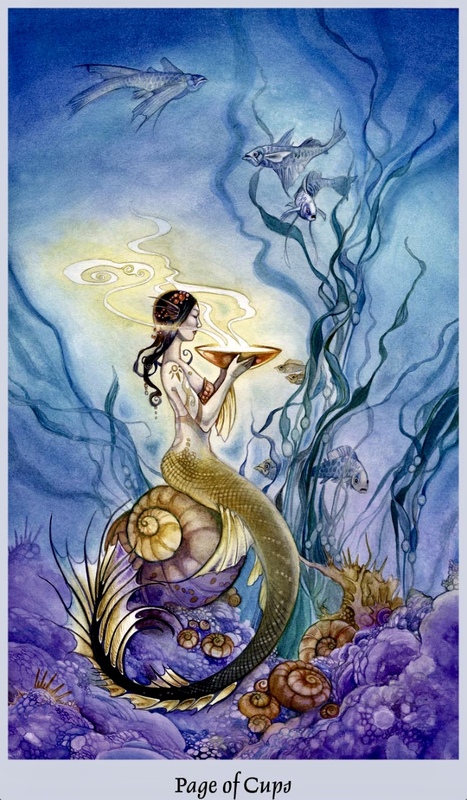 Page Of Cups: “She delves down through the waves, seeking to be alone and to find a peaceful place to contemplate her own thoughts. She brings a cup with her. It brims with the captured essence of sunlight from the world so high above her own. It contains the tiny sparks and flashes that have drifted down to the sea bed in bits of golden coin or in the stray shaft of sunlight that manages to pierce through the fathoms. All of that is distilled into the precious contents held in her hands. She lifts the cup underneath her face, feels that remembered warmth of the sun’s kiss upon the wave tops. The heat spirals out through the water with tendrils of peace and tranquility. The radiance sparks her thoughts and her imagination. She feels her mind begin to set adrift, and her visions fills with dreams of the fantastic. This is a card of contemplation but it is also a strong message of your advancement in manifestation ability. You have reached a new level of creation energy, can you feel it? It is up to you what you create and you must be aware that if your thoughts are weighted down by worries, doubts and fears, you will likely manifest more of the same. If you are using your energies to focus upon what it is that you desire to create, then this too is readily available to you now. The cup in the image above is golden, a sign of prosperity, of confidence and of self worth. All this is available to each and every one of us. If we choose to raise our vibration to match it. Do you see her serenely focusing her intent on the content of the cup? There is no struggle here; there is also no distraction. Only focused intention. Concentrated energy. There is a certain knowing here too, faith and trust in the process, and inner peace and harmony. Gaze again at the image, take that in as your own vibration. Feel the shift happen. The spiral is a representation of birth/rebirth, growth and expansion. The spirals above can signify the ever expanding nature of your conscious awareness and what is truly possible. The sun symbolizes the creation, life force, energy and light. Anything is possible, if you decide to create it.